Maoricolpus roseus is a species of sea snail, a marine gastropod mollusc growing up to 9cm in length. It is a filter-feeding mollusc. They are most commonly found in intertidal to shallow waters, but may occur as far down as 80 metres. It was first introduced to Tasmania about 80 years ago. 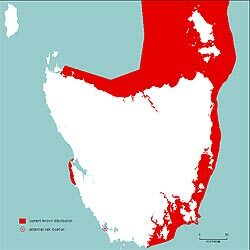 Since then it has become established in vast beds in northern Bass Strait and off the coasts of eastern Tasmania, Victoria and New South Wales. It most likely came to Australia attached to live oysters shipped across from New Zealand or on ships loaded with dry ballast that consisted of stones gathered from New Zealand's shore. It has reached densities where thousands of shells are found in one square metre. The ability of the screw shell to blanket the ocean floor has resulted in a modified sea floor which is a problem to scallop fisherman. It may also be causing the local extinction of native Australian screw shells through competition. There are no control measures in use and natural predation rates are much lower in Australia than they are in New Zealand.